WASHINGTON, D.C., January 14, 2014 (CNA/EWTN News)—The editors of USA Today have urged the Obama administration to stop trying to require the Little Sisters of the Poor to abide by the federal contraception mandate in violation of their religious beliefs. “When the Obama administration picked a fight with Catholics and other religious groups over free birth-control coverage for employees, sooner or later it was bound to end up doing battle with a group like the Little Sisters of the Poor,” the USA Today editorial board said. 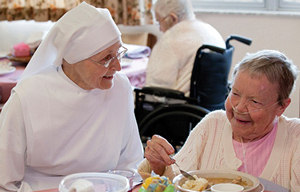 The Little Sisters of the Poor have worked for 175 years to care for the low-income elderly and dying in communities throughout the Unites States. The community says its work is now being threatened by the federal contraception mandate, which was issued under the Affordable Care Act and requires employers to offer health-insurance plans covering contraception, sterilization, and some drugs that can cause early abortions. The religious congregation on December 31 secured an emergency stay from the U.S. Supreme Court against the mandate. The Obama administration responded by reiterating its commitment to the mandate and its requirements. The publication said the administration wrote its religious exemption to the rule “so narrowly” that it failed to exempt Catholic and other religious hospitals, colleges, and charities. The Little Sisters of the Poor fail to qualify because they are not affiliated with a particular house of worship. Rather than extend a religious exemption to the Little Sisters, the federal government has instead offered an “accommodation” under which the sisters can sign a document authorizing an outside group to provide the coverage they find morally objectionable. The punishment for noncompliance with the mandate is “ruinous fines,” with the Little Sisters facing $4.5 million in annual fines for just two of their 30 homes. USA Today noted that most of the legal cases against the mandate have been successful so far. More than 300 plaintiffs have filed lawsuits against the mandate, and legal injunctions have been granted in most cases, which are largely still working through the court system. “The administration should take the hint,” the editorial said, calling on the federal government to adopt the “most expansive” religious exemption. A “more meaningful” compromise would give religious freedom “the wide berth it deserves,” the publication stated.